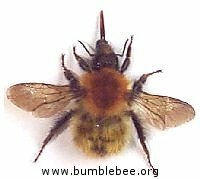 6 most common bumblebees in the U. K.
There are about 19 different species of bumblebee (and six species of cuckoo bumblebees) found in the UK, 68 in Europe, 124 species in China, 24 in South America, and around 300 in the world. On these and the linked pages I will show you how to recognise the six common species (below), and there is a page of less common species, and North American bumblebees, but really the best way to identify all bumblebees confidently down to species level is to use the keys and photographs in books, and to look at the bumblebee through a hand lens. However for the average person the drawings, descriptions and photographs on this web site should be enough. 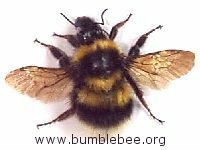 You can also try the Quick ID Guide, and a whole pile of other pages on bumblebees and similar insects at the bottom of this page.. 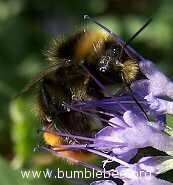 The head, which can be quite difficult to see on a foraging bee as it is deep in the flower. The thorax which has the wings and legs attached. It is really just a box of muscles. The biggest being the flight muscles. The abdomen which has the honey stomach for storing nectar, the sting, the wax glands and all the digestive and reproductive organs. The lengths quoted here are in millimetres and are taken when the tongue is folded under the body. Males have slightly longer antennae, bigger eyes, no sting and no pollen basket. Workers are usually smaller than the queen. 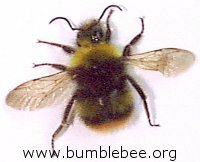 This is our largest bumblebee, and usually the first to emerge. The thing to note on the queen is the dirty orange colour of the hairs at the end of the queen's abdomen - see below. Slightly smaller than Bombus terrestris (above), and with a white tip to the abdomen of queens (below) and workers. 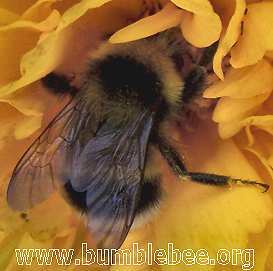 Probably the most easy to recognise of all our bumblebees with its black body and bright orange tail. Although the queen's body (below) is as long as that of B. terrestris it is not as heavily built. Lengths, queen 20-22, workers 11-16 - look the same as the queen, but are much smaller. 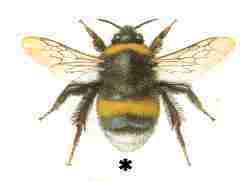 This bee has the most colour variation of the six common species. The yellow bar on the thorax is usually there, but may be reduced to just a few hairs. The yellow bar in the middle of the abdomen often has a break in the middle, and sometimes it is just a few yellow hairs, and occasionally totally absent. The pink/orange/brown tail hairs are usually present, but the colour varies. Workers have a white tail. Lengths, queen (below) 15-17, workers 10-14. Workers look the same as the queen. *Images taken from the excellent book Bumblebees, published by Pelagic Publishing.